This all-around high performance shoe offers precision, sensitivity and power through technical innovation. 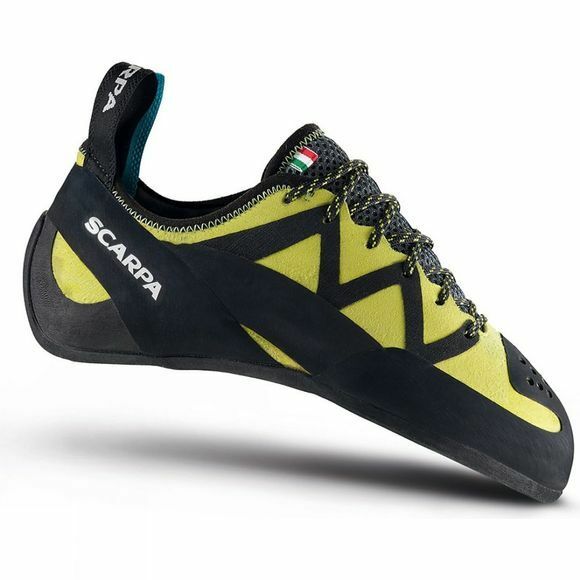 The asymmetric, moderately down turned shape offers great instant comfort and Scarpa's Bi-Tension reversed slingshot system connects the critical area under the toes directly with the heel area keeping the original shape for an extended time, and drawing power from the toes without crumpling them into the end of the shoe. The heel fit is excellent and allows efficient and precise heel hooking. The Cage-Speed lacing combined with a comfortable mesh tongue provides incredible fit and ventilation. The new Vibram XS Edge rubber adds outstanding stability for edging.